In part one of this series, I arranged some criteria by which to judge any note-taking system. Some may disagree, but they are only MY preferences as well as what I noticed many respectable scholars doing. The quick-and-dirty of it is that I want my note-taking system to be simple, searchable, and retrievable . . . forever. After much toil and asking around, my current solution to this conundrum is (drum roll): subjects and tags. By subjects I mean arranging your notes by subject-headings. You can do this no matter which program you use. Arranging by subject solves the issue of having a million documents in a folder. It also keeps everything on that given subject in ONE place so you can search it later. For example, let's say you are taking in-depth notes on a book. Do you make a separate file for that book? If that's the case, are you going to make a separate file every time you read a book? How will you retrieve this information (read: search this information)? So, for any given program, this would look like creating files (or notes) with the "subject" as your title. (e.g., "New Testament," "Greek Grammar," "Systematic Theology," etc). You can be as general or as specific as you want. If you read the post by Dr. Craig Keener last week, then you know that he used to file index cards by scripture. I emailed him to ask what he does now, and "subjects" is it! I have also heard of other successful authors using a similar system. A "subject" exists on your machine as a single document. After you create your document, you just place every piece of information you read—along with its source—inside this document. And yes, after a few years this document will be hundreds—maybe thousands—of pages long, which leads to the next part of my solution. Don't act like you don't know what a tag is! "Hashtags" are not a new concept. A tag is simply metadata by which you can collate information quickly. So, click a hashtag on a social media platform and you instantly get every piece of information (post) attached to that tag, even though they are from disparate sources (people). Ten years from now, your subject-document will have thousands of pages of notes in it. How do you recall information? Tag it! Writing a paper on verbal aspect? Just go to your "Greek Grammar" document and search for whatever tag you put that information under (e.g., #verbalaspect, #perfectaspect, etc.). Here is the part that is really going to blow your mind. You don't need a fancy software that has a tagging feature; you can just manually tag things. In a simple Word Processor like Microsoft Word, you would write a word or two after the sentence/paragraph/block of notes. Take the tags you use and put them in a list somewhere so as to make sure you are using the same tags every time. When you want to retrieve information, just type the name of the tag in Word's search bar (Command+F for Macs; Control+F for PCs). 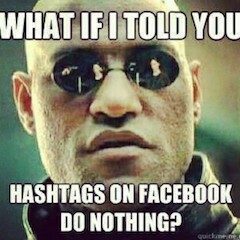 But let's be honest, auto-tags (the program keeping track of your tags for you) would be nice, huh? The good news is that a whole new genre of note-taking apps is emerging. Many of these apps have specific tagging features. To my knowledge, the most popular ones are Ulysses, Bear, and Evernote. I personally use Bear because, quite honestly, it's the easiest one, and this simple Mississippi-boy likes easy. So, I'll just give you a quick look at how I do this. In all its glory . 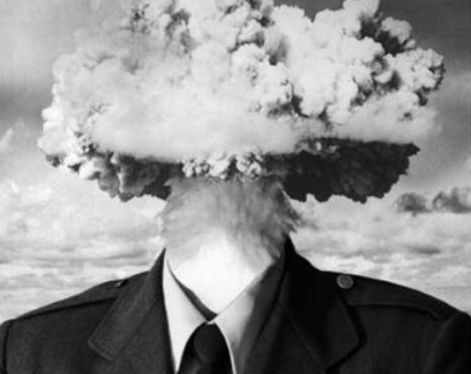 . .
Evernote and Ulysses contain too many features for my liking. If I had access to these features, I probably would never use 95% of them. Bear is good at one thing: note-taking. As such, it's free from clutter and confusing functions. Additionally, bear is FREE! There is a subscription option which allows you to sync up with your iPhone at only $15 per-year (I happily subscribe). Even without the subscription, though, most of the functionality is there. A subscription-based program will usually be the desirable one due to the incentive it puts on the app designers to keep improving. If the updates stop, the designers stop getting paid. Bear does NOT have folders. You will notice on the far left that the app's hierarchy is tags. This way, if you have a piece of information that applies to two different subjects, it doesn't matter which note you put it in as long as you tag it correctly. The second column contains my "subjects"; i.e., my documents. I personally have one note for each book of the Bible, as well as the various subjects pertinent to my research and interests. The third column is where you actually take notes. In the picture above, no actual tags are shown; I will demonstrate the tagging features below. In this specific case, each verse gets a bullet and then notes for that verse go underneath. 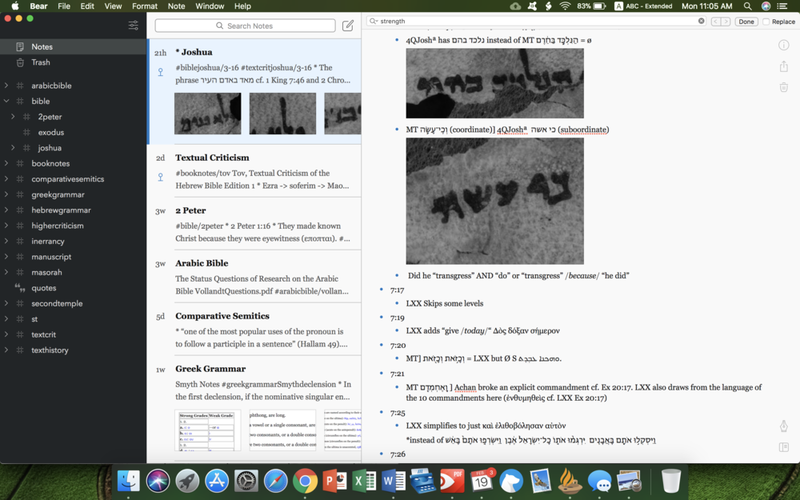 You will even notice that I dragged in some pictures of Qumran variants with Bear's simple drag-and-drop feature. The tags are in grey. To type a tag, you just press the "#" key like you would on any social media platform. Bear also nests tags. You can see on the second bullet that I have two "sub-tags" (qumran and lxx) under the parent tag #textcrit. If you scroll to the picture above and look at the column with the list of tags, you can see that bear will even arrange your nested tags underneath the appropriate parent tags. Finally, notice how I began to type "#te" and the auto-tag feature popped up. This feature will display even if you begin typing a tag that is nested. This way, if you are not sure whether or not you have used a tag before, you can just try it out and bear will recall it for you. 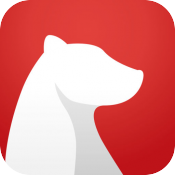 Bear has a few other neat features as well but, as stated above, you could get by with any Word Processor. I hope this has been helpful. Please email us if you have any questions!